Coloured postcard of a laker steaming out of Buffalo harbor past the lighthouse into Lake Erie. According to the notes on the face of the postcard the lighthouse tender CROCUS is lying off the supply depot on the south pier. 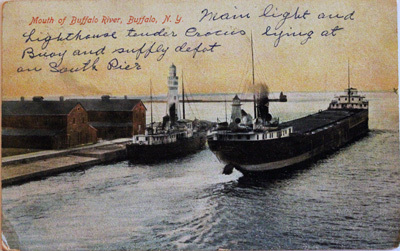 "Mouth of Buffalo River, Buffalo, N.Y."
Handwritten: "Main Light and Lighthouse tender CROCUS lying at Buoy and supply depot on South Pier"
Reverse: "T.P. & Company N.Y. No. 3 Made in Germany"